I’m back in Naples, and I’m excited to be back at it 100%. We have a busy season ahead of us, and, in addition to all that is going on, we are getting ready to launch over a dozen new ventures. 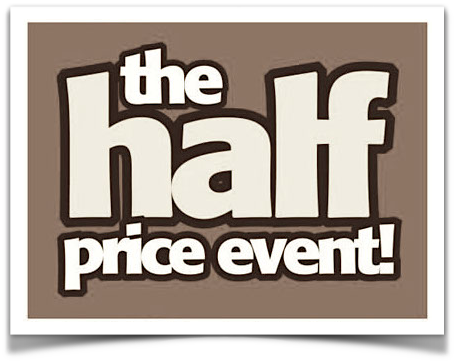 Walker Sports Audit, iWorldFundraising, Grivani Corporate Gift Giving Registry, Grivani Wine, Keller Cellar, Porta Via Cafe’, Christian Co-Op, Christeus, FedCloud Vault, FedDROP, College Rep Program, ABX, TW&Co Naples, Al Marie Cosmetics, Fashion Resource Group, Advantage Divorce Services, … are all opportunities we are looking to develop. I enjoyed getting some of our Advantage Global Management team a little jacked up about risk-free investment the other day before I left town. It was fun. I’ve let it sit a few days, and I’m certain a few of them have been wondering [and challenging] just how in the world it is possible to have zero risk investments? Well, admittedly, I took some dramatic license to get them in the right frame of mind [because it is essential that we launch quite a few new businesses that are expense driven]. The IRS and the New York State Department of Taxation and Finance have combined to dramatically reduce the risk with Expense Driven Investing in NY State for the investor who has a profitable NY State business operation to offset any potential losses. Before I go any further, let me differentiate Expense Driven Investments [EDI] from Capital Driven Investments [CDI]. Expense Driven Investments are made with pre-tax earnings in business ventures that call for fully deductible expenditures like payroll, marketing, website hosting, utilities, travel, etc. to develop the business rather than depreciable capital expenditures. While Capital Driven Investments are made with after-tax earnings in business ventures that call for significant depreciable capital investments like inventory, equipment, buildings, etc, or, worse yet, non-depreciable stock purchases. The reason why EDIs are reduced risk is because of the 50% tax burden that the IRS [39.6%] and NY State [8.82%] put on earnings in excess of $400k derived from LLCs or SubChapter S Corporations, both of which flow all profits directly to the shareholders. There is a dramatic difference between pre-tax earnings and after-tax earnings. If you have a business operation that is delivering in excess of $400k in taxable profit, you are essentially paying 50% in taxes on every dollar over $400k. Your $400k in pre-tax earnings turn into $200k in after-tax earnings. This means your pre-tax earnings are cut in half before you actually get to invest them. And that means that your investment impact is cut in half. If you make a Capital Driven Investment, you must first earn almost double the capital investment. Let’s say that you are going to invest $200,000 in a stock purchase or a new business through a capital investment. In NY State, you would have to earn $400k in pre-tax income, pay $200k in federal [39.6%] and state income tax [8.82%], and then invest the remaining after-tax earnings of $200k. 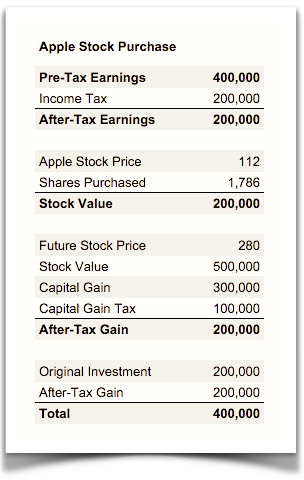 This means that if you were to buy $200k worth of Apple stock at today’s price [$112], you would have to sell that stock at $280 per share for you to get back to your original $400k in pre-tax earnings. How likely is a 150% increase in that stock price? And that’s just to get you back to your original pre-tax earnings of $400k. But if you were to invest your $400k pre-tax earnings in an Expense Driven Investment, you would get the full impact of your $400k. In essence, the government is saying that if you are too lazy to invest your earnings, they’ll gladly take half. With reduced risk EDIs your investments only have to succeed half the time instead of all the time. Let’s say you have various business investments that generate $5M in pre-tax earnings. At the end of the year the government will gladly take 50% of it. They will thank you for your contribution. And let’s say that you are going to make another $5M the next year. Well, it is the same story – another $2.5M goes right to a very appreciative government. At the end of two years you are left with $5M of the $10M you have earned and the government has $5M of it as well. That leaves you $5M to invest with no margin for error. But let’s say you were to take your $5M in 2016 pre-tax earnings and invest it all in 25 different expense driven businesses [at an average of $200k in each]. And let’s say you have a tough go of it and half of the new business ventures fail. You have a gaggle of K1’s that add up to $2.5M in losses. $2.5M has been squandered. But here’s the good news: You get to deduct that entire $5M investment because it is all in deductible expenses, and that means that the $5M you earn is offset completely by the $5M you spent on you EDIs. At the end of two years you still have another $2.5M to invest and $2.5M in new business operations [if only half succeed]. And we aren’t even taking into consideration what the earnings might be on the half of the businesses that didn’t completely fail. With your pre-tax earnings invested in EDIs you double the investment impact of every dollar you invest. I used a combined tax rate of 50% for my calculations since using 48.42% would have been cumbersome and the 1.58% differential is not really substantive to my premise.